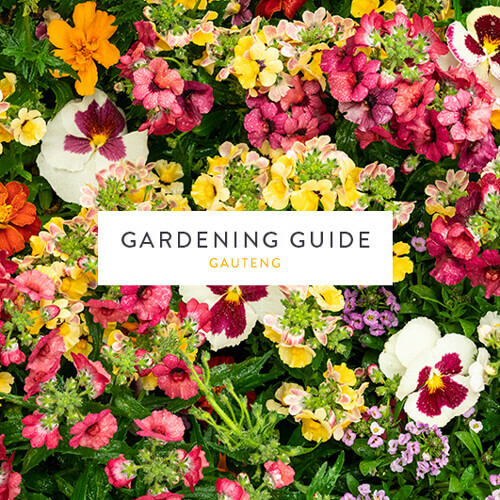 Now that spring is upon us, it’s time to bring your garden back to life with colour and variety. Lawn care is also top of the agenda. Combine a regimen of regular watering and feeding to get grass ready for the summer heat, and urge regrowth in bare patches by top-dressing with fine compost. Arbour Week takes place 3–9 September 2018, so now’s the perfect time to green the community. We’re running a buy-one-get-one-free-tree promotion throughout the week, and on Arbour Day (7 September 2018) you’ll receive a free tree sapling when you buy a bag of compost for R17. Our guide on sapling care, will ensure a strong and healthy start for your young tree. Some indigenous trees to plant this Arbour Week include false olive, wild pear or lavender trees. Eggplant, lettuce, spinach, cabbage, beetroot and chillies are great vegetables to plant now. Lawns require 2:3:2 and 4:1:1 fertiliser. Feed trees with 3:1:5 fertiliser. Fruit trees could do with some Nitrosol and 3:1:5 fertiliser. Frost-damaged bedding begonias don’t need to be replaced – simply cut back to remove the parts that were damaged during winter. With a healthy dose of water-soluble fertiliser, the begonias will be back on their feet in no time. New vegetable gardens will need special attention. To control insects, spray with Ludwig’s Insect Spray or Margaret Roberts Organic Insecticide. Both are Ecocert approved for use by organic gardeners. Roses will need protection against disease and fungus this time of year. To ensure their health, spray roses with a mix of one part Rosecare, one part Trelmix, one part Seagro, one tablespoon of vinegar and one teaspoon of dishwashing liquid. Once 75% of the blossoms of any fruit trees have dropped off, you can start spraying against fruit flies. Thereafter, spray every 10–14 days. Readily available in punnets, these perennial vegetables fare best if planted as soon as spring has sprung. Choose your spot wisely, as these crops will be there for a long time. The young plants will form spears after 12 months, but don’t harvest any asparagus during the first 2 years – they need to put all their energy into establishing deep roots. By the fourth season you might have to harvest twice a day during the warmth of spring to keep up with their growth. With all the B vitamins, vitamin C, calcium and iron in these tender and crisp veg, your whole family will be better off for your investment. To find out how to get yours started, read our guide to growing your own asparagus.